It’s soooo soft. 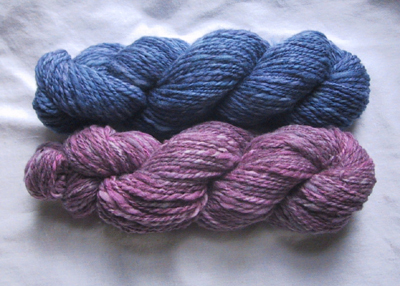 And I’m so pleased with the consistency — it’s still a bit thick and thin, but the weight/yardage of the skeins is quite close (53g/115 yd and 56g/119yd) even though one was spindle-spun and the other was wheel-spun. Go me. Hope everyone had a lovely, relaxing, blessed, drama-free Christmas! We had a wonderfully laid-back day…stockings, then Mass, then presents, then the big family dinner, more presents, coffee and cookies, then we left the kids at the ILs for the night and returned home to prepare their room for all the new loot and watch as much Prison Break as possible before falling asleep. Whew! 105…earflap hat for my sweet niece. Lamb’s Pride Bulky. 106…My So-Called Scarf in HPY 6-ply bulky merino, in one of my favorite colorways, Emerald Blue. Now, I’m not a scarf knitter — they make me batty, they are so boring — but I love this scarf. Perfect pattern for the yarn. 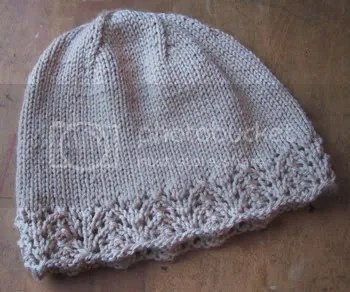 Lace-Edged Women’s Hat (my pattern, link in right sidebar), knit in RYC Cashsoft Aran on US6 needles. I knit this over the weekend in every single stolen moment I could find — riding in the car, waiting in line, waiting for file uploads, etc. Sure hope it fits. 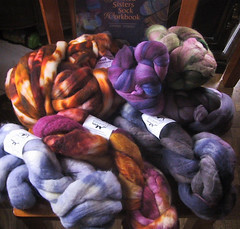 Long story short, I purchased superwash merino, but it has a bonus fiber included. The fiber that remained undyed is (we think) bamboo. 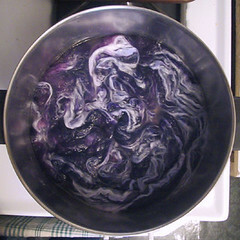 I’m spining it to see if it works into my color scheme, but if it doesn’t seem appropriate, I’m spinning this last patient donor some silk. I have this friend and I owe her a package full of stuff. I keep saying that I’m going to send it any day, but I haven’t yet. She’s on the other side of the world, though, and she has no Internet access, so she’ll never know. Well, maybe she’ll figure it out when she sees the postmark and the customs form…but, whatever. 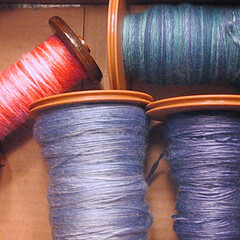 Really, I had a good reason — I wanted to finish spinning this so I could send it along. 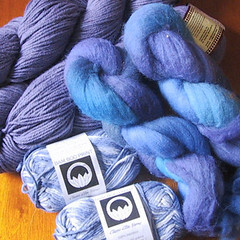 BMFA 50% merino, 50% tencel. Yum. So we’re losing another yarn store. 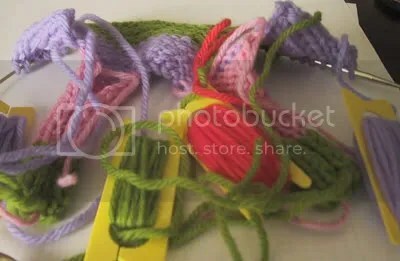 To be totally honest it’s not my fave — too many novelty yarns for my taste, and it feels crowded even when there’s only a few people there…but they are quite nice and helpful and I’m sad to see it go. Needless to say, I’m a little behind. No photos for these, you’re just going to have to take my word for it. FO #101: those mittens I posted about back here. Finished a long time ago. 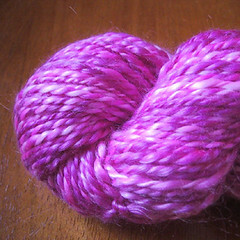 Wool of the Andes, dyed by my then-5 year old. They turned out too big, and I officially declare here and now that I do not like knitting mittens. 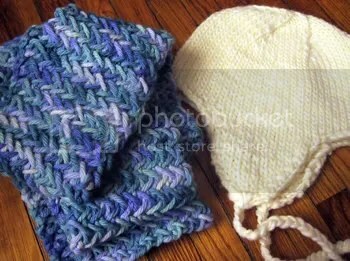 FO #102: Fair Isle baby pants. Or rather, baby pants with fair isle around the cuffs. Which is cute and all, but a royal pain and I need to see if blocking is going to even it all up. Merino Style. Dregs of many colors. Who knows how much. FO #103: Log Cabin Socks from Melanie Falick’s Handknit Holidays. Pictured partially completed here. These were a gift, and as soon as the last end was woven I threw them in an envelope and bid them adieu, only to realize later that I hadn’t photographed them. I’m funny like that — I have to mail things immediately when the urge strikes, or it doesn’t get done. Usually I don’t even throw notes in with my packages. I just have to get. them. out. NOW.